Will Make Beats For Food : Classic Material: What Makes Up A Classic? 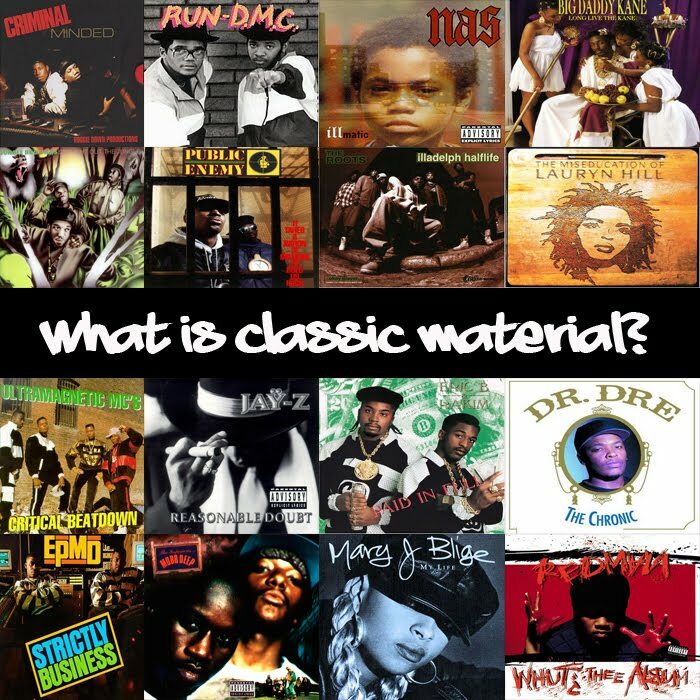 Classic Material: What Makes Up A Classic? #1. A classic is an album that can stand the test of time. For example, EPMD's "Strictly Business" dropped in '88 when I was 14 years old and in the 8th grade. I'm now 39 years old and I STILL bang that album like it just dropped yesterday! That's classic material. Now of course I'm not saying that you have to wait 10+ years to give something 5 mics but can cats wait at least 3-5 months before labeling it a classic? There's a rack of dope music that drops everyday and on the first listen I'm like "this is dope." And then I look up and a year has gone by and I haven't even thought about the album, let alone played it. See in my eyes, that's a hint and a half right there that it's not a classic. A classic is an album where only so much time can pass before you wanna hear it again. #2. I LOVE (not like or think they're aiight) 90% of the album. For example, Public Enemy's "It Takes A Nation..." is EASILY a 5 mic classic but I don't LOVE "Party For Your Right to Fight" and "She Watch Channel Zero" but I can't let those 2 songs stop me from christening one of the most important albums of the last 50 years a classic right? I know a lot of people who say EVERY song has to be perfect to give an album 5 mics but to be honest, there's aren't too many albums that I feel that way about. So for me, if 90% of the album is incredible, then that's classic material. #3. The beats have to be BANANAS! I can't think of one album that I've given the classic tag to where the beats haven't been flat out sick. I don't care how nice a MC is on the mic, if the beats aren't there to compliment how nice you are, you've already shot yourself in the foot. #4. The rhymes have to be dope. Now, some folk may be asking, "well, why do the beats have to be BANANAS but the rhymes can just be dope?" And that probably comes from me being a producer and listening to beats first and foremost before I even hear the rhymes. For me, I don't need you to be a lyrical surgeon like Nas and Big in order for you to get 5 mics from me. There are a lot of mid to late 80's albums that dropped where I wouldn't say the MC was "lyrical" but I'd still give the album 5 mics. #5. You gotta be unique. Which is why I don't feel there have been a ton of classics during the last 12 years and why we had SO many classics that dropped between '87' and '97. I hate to sound old but "back in the good ole days" the whole point of making music was to be original. The last thing you wanted to do was to come out sounding like someone else which is why I always compared old school hip hop to cable television cause there was a channel for everybody. De La didn't sound like PE who didn't sound like EPMD who didn't sound like Rakim even though they all came from Long Island. And that's why each one of those groups I just named have at least one classic album under their belts. But bet money that if you found 5 MC's coming outta the same borough or city now, all 5 of 'em would either sound alike or be rapping about the EXACT same stuff. I mean how many artists can you name nowadays, that are really trying to be original? And even if you can name a handful of cats, then ask yourself how much of their music is classic material? #6. The albums means SOMETHING to you. Now this isn't a rule for an album to be tagged a classic but sometimes the mixture of an album meaning something to you along with the music being dope can add up to it being a classic. 4 years ago when Strictly Hip Hop was having it's anniversary show, the show's topic was about classic albums. And to say there were some beat 'em down, drag out debates weeks before we even got to the show would be a understatement. But the dopest part about the show for me was understanding that there are albums on people's classic lists that had the rest of us scratching their heads looking sideways because the album meant something to them and ONLY them. After pollying on the topic long enough we actually made a segment of the show where cats would name an albums that only they thought would fall into the classic category. My pick was Common's "One Day It'll All Make Sense." When that album dropped I had just graduated from Morgan State and moved to Atlanta to try to get on with my music. Needless to say the music wasn't panning out AND I couldn't find a job in my major (communications) AND on top of all of that me and my girlfriend at the time seemed to be beefin' ALL of the time. So with all of those struggle going on in my life, for some reason that album just spoke to me. Now I'm sure 90% of folk are looking at me like "that was a dope album but a classic?" But again, it was a classic to me. Sometimes music just speaks to you. Similar to how you may be in church and it feels like the Pastor is preaching JUST to you, like the rest of the congregation isn't even there, that's what that Common album felt like to me. And at the end of the day this has always my litmus test to see if an album is a classic. If I had to drive from Philly to Atlanta and back and I could only take ONE album to listen to the whole ride, what would it be? And 9 times outta 10, whatever I album I pick, is a classic.